Temperature and relative humidity monitoring with the Tinytag Radio Data Logging System is aiding conservation work in museum stores and galleries. Ultra Radio data loggers monitor temp/RH in two separate sites, with data accessed from one central location, to help maintain the correct environment for the conservation of sensitive items. The Canal & River Trust is the charity entrusted with the care of 2,000 miles of waterways in England and Wales. CRT is also responsible for three museums: the National Waterways Museum at Ellesmere Port, Gloucester Waterways Museum, and the Canal Museum, Stoke Bruerne. One of the most important ways that museums care for their collections is through preventive conservation. Fundamental to this approach is storing collections in the right environment to minimise deterioration, so it is essential that the CRT monitors temperature and relative humidity in the areas where the collections are housed. The Trust is using Tinytag Ultra Radio data loggers to record this information. The Radio Data Logging System collects data automatically using wireless communications, and sends it via a receiver for viewing on a PC, across a LAN, or remotely across the internet. The Ultra Radio Loggers' discreet design is ideal for unobtrusive monitoring in public areas. The Canal & River Trust has five loggers at its site in Ellesmere Port located in the stores and displays. There are also three loggers in the displays at Gloucester Waterways Museum, and the Trust soon aims to use the loggers across all three sites. The Ultra Radio loggers monitor the temperature and relative humidity to build up a picture of what is happening in the stores and galleries, to help assess the need for environmental control measures. In general, museums aim for RH between 40% - 65% and temperature between 10 - 21°C. The Tinytag Radio System is an ideal solution for the Trust, as it provides data from different sites that can be accessed using their IT network at one central computer. Margaret Harrison, Collections Manager at the CRT comments "We had a really great service from Gemini Data Loggers. They helped us to identify exactly what we needed and how the system would work best for us and what we could achieve within our budget. The after sales service has been brilliant too and there's always been someone available to help." 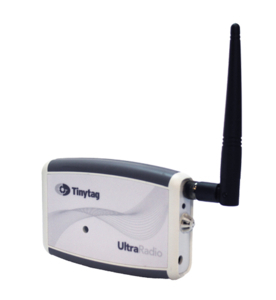 Automatic data collection with Tinytag Radio Data Loggers. An easy to set up, self-configuring and flexible wireless system.